The Odinist Fellowship, a body representing 2,000 so-called ‘pagans’, has applied for reparation from the Church of England ‘for its former crimes against the Odinists’ (‘We want our stolen churches back, pagans tell Archbishop’, The Sunday Telegraph, 27 August 2017). It suggests a public apology and the symbolic handing over of two churches, one from the diocese of Canterbury, one from that of York. The Bishop of Chichester has sensibly responded by saying ‘As yet I am unconvinced as to the strength of Odinist faith in these parts’; and it is difficult to see how these cranks can in any way be considered the heirs to the dispossessed pagans of the past, or even to have any coherent grasp of their religion. There is no doubt, however, that the Christianisation of England was an often brutal process, as the following story reveals. The copper-alloy saucepan or ‘skillet’ discovered in 2005 in a shallow ditch at Shalfleet on the Isle of Wight has been dated to the late seventh century A.D. and, its long handle decorated with a cross, is the earliest Christian object to have been found on the Island. It is in remarkably good condition, given its age, and is associated with a particularly dramatic episode in Island history. When the two young brothers of the defeated King Arwald fell into his hands, they, too, were put to death, despite having been hurriedly baptised. The genocidal Caedwalla was nevertheless true to his word. The promised quarter of the spoils was duly handed over to St Wilfred, the exiled ‘Bishop of the Northumbrian peoples’, who is said to have landed at Bembridge and to have set up his first church at Brading. Thus was England’s last pagan enclave brought to Christ. The skillet was no doubt used by the first generation of Christian colonists in Shalfleet (‘shallow stream’ to the Saxons), perhaps in their religious ceremonies. (They were only the latest wave of incomers, for Bronze-Age chiefs had been buried in mounds to the north and south of the village and the Romans had come in their turn to build houses there.) In 2005, excavations in the garden of the Old Vicarage revealed the remains of eight of these early Christians, their skeletons orientated east to west, as was proper for people of their religion. The bones, both of men and women, were in a poor condition, in death as in life. Arthritic spines are suggestive of, literally, back-breaking working conditions on the land; pitted eye-sockets indicate dietary deficiency; all had suffered injuries of some sort (though not obviously in battle) and had rotten teeth. Half had died in their twenties or early thirties and the other four may have made it to forty-five. One of the skeletons has been carbon-dated to the years between 660 and 734 A.D., which fixes it firmly in the period described by Bede. 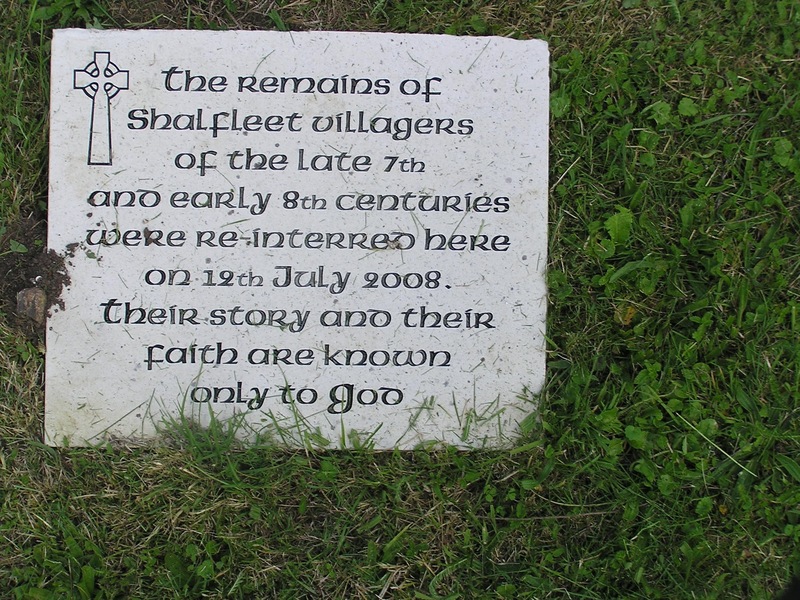 (Ruth Waller, Archaeological Excavations in Shalfleet (Shalfleet, 2008.) The burials are evidence of the swift realisation of Caedwalla and Wilfred’s policy to pacify and Christianise the Island. The site of the Saxon cemetery was subsequently developed for housing. 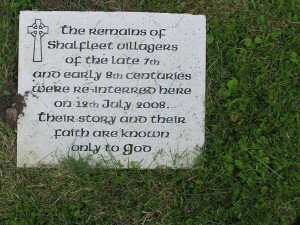 In July 2008, the displaced skeletons were fittingly reinterred in the adjacent churchyard. A stone, with a touching inscription, marks the spot. 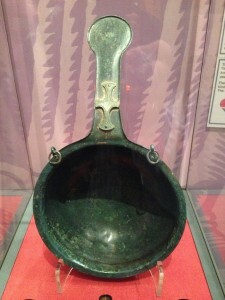 The skillet, which had been discovered by a metal-detectorist, was bought by the Isle of Wight Heritage Service and can be viewed in the Museum of Island History in Newport’s former Guildhall, for the price of a mere £2.00. Next Entry: Shalfleet: Church Tower or Castle Keep? Next Entry Shalfleet: Church Tower or Castle Keep?